The Camelbak instant classic for portable hydration. The spill-proof, .75 L BPA-Free eddy™ Bottle makes it easy to stay hydrated on the go. Redesigned to provide faster flow and enhanced durability. 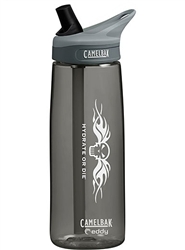 Designed with the classic Camelbak Hydrate or Die™ logo. Stop throwing away water bottles when you use the eddy. First-time use: What's the clear thing on top of the cap for? Do I remove it or cut it to drink? Can/How do I freeze the CamelBak® eddy™ with bite valve? Can I use the CamelBak® eddy™ in high-altitude/ low-pressure environments (i.e. airplanes, mountain altitudes, etc)? Yes, but with special care because pressure can force liquid out through the straw. Keep the bottle right side up with the bite valve in the closed position. Remove the straw for additional protection. Expect a bit of 'spurt' during the first sip. You may also twist the cap open to release any pressure and then close before your first sip. What happens if I put sports drinks/juice in the CamelBak® eddy™? What max temperature (freezing/boiling water) can the CamelBak® eddy™ withstand? The CamelBak® eddy™ can withstand being filled with warm water up to 65 ºC/149 ºF or stored in below freezing temperatures. Is the CamelBak® eddy™ microwave safe? Feel free to use the CamelBak® eddy™ to warm up liquids (ie. up to a minute), but we don't recommend cooking your dinner in it. Do NOT microwave with the cap in place as it contains metal screws that are not microwave safe. Does the CamelBak® eddy™ work with back country purifier filters/microfilters? The CamelBak® eddy™ is compatible with filters that adapt to a 63 mm screw top opening (in other words, it's compatible with most filters on the market). No, there is no residual taste in the bottle materials, and it's also stain-resistant. Some sports drinks and other flavored beverages can leave behind residue of flavor oils that could require extra cleaning. Removal of the straw allows a 'tip and sip'mode of drinking.